STAND UP DESK CONVERTER - You do not need to buy a brand new stand up desk. Use your existing desk with Mount-It! stand up desk converter - Get the same health benefits without breaking the bank. ADJUSTABLE HEIGHT ERGONOMIC WORK STATION - Move from sitting to standing in mere seconds with our easy-to-use gas spring arm system. Bring back control to your desk and work from more comfortable positions. Studies have shown standing and working is a healthier and more productive alternative. KEYBOARD TRAY AND DUAL MONITOR MOUNT - Wide keyboard tray with soft wrist pad for comfortable use. 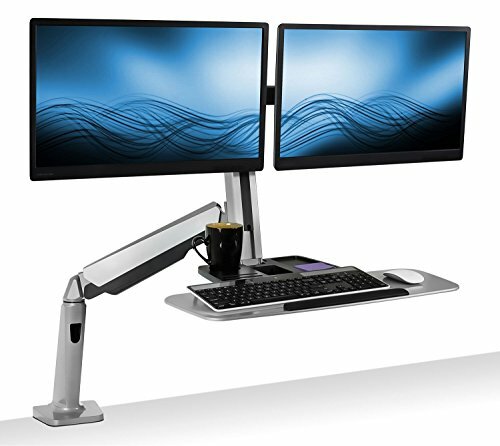 Universal VESA compatible monitor mounts (VESA 75x75 and 100x100) fits monitors up to 27 inches in screen size. PREMIUM FEATURES - Compartmentalized storage tray to hold office essentials, your phone and coffee mug. Sleek silver finish. Cable management for clean installation. EASY INSTALLATION - The base comes with dual clamp and grommet option to suit your desk. Heavy-duty base provides stability to the entire assembly.